As we inch closer to summer, what better way to enjoy the warmer weather than with a get-together with family, friends, and s'mores! And now Sterno is back with a new s’mores making device. The S'mores Maker Jr. is built with entertaining and family fun in mind. The S'mores Maker Jr. brings the joy of making fireside s'mores to any location—outdoors or in! Each S'mores Maker Jr. is a fully equipped, self-contained s’mores making unit. The S’mores Maker Jr. features a fuel-securing base, a mesh safety screen, 2 roasting forks, and S'mores Heat for an all-around perfect way to fulfill the s'mores craving! Get your mouth watering with some further s'mores information and inspiration HERE. Tryazon will select 150 hosts for this opportunity. Those chosen will receive a party pack with 2 S'mores Makers Jr. Kits and more to showcase and sample to friends and family! Learn more about the products and party by clicking the tabs below! 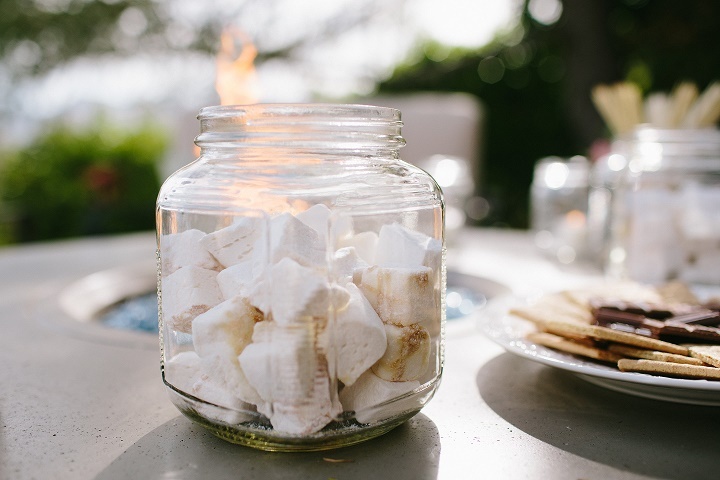 Sterno S'MORE S'mores Party Host Guide to help you plan and carry out the party! For more than a century, the Sterno Products name has been synonymous with quality and performance in food heating and warming. Today Sterno delivers the most comprehensive line of portable warming, ambience, butane, and catering products to the hospitality and retail markets. We are committed to educating our end-user customers and distributor partners on safety, proper usage, environmental responsibility, and product efficiency. We share our customers’ commitment to the environment and strive to improve manufacturing and marketing practices to reduce our footprint on the earth. An iron-clad commitment to excellence ensures perfect performance every time! Learn more about Sterno Products HERE . About the S'Mores Maker Jr. 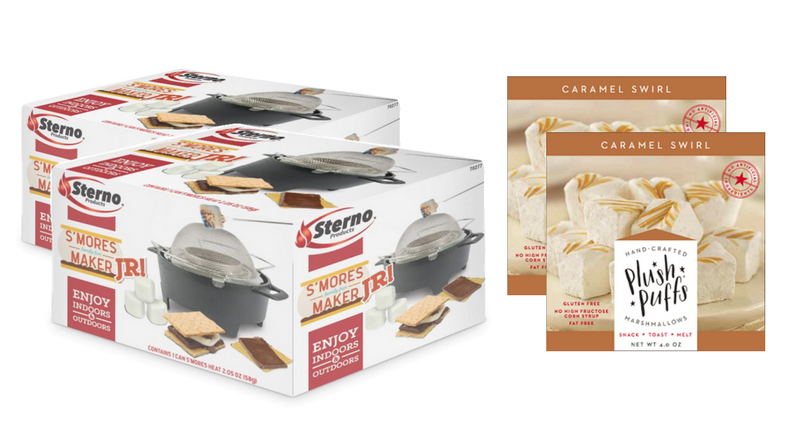 The Sterno S’mores Maker Jr. is perfect for the DIY home-entertainer. This fully-equipped device features all the elements to enjoy year-round, outdoors or in! Built with safety in mind, the S'mores Maker Jr.’s Heat Management System keeps the specially formulated S’mores Heat (also included) safely secured under the roasting screen. Simply light the S’mores Heat, skewer your marshmallows, and you’re ready to roast. The Smore's Maker Jr. adds even more fun to picnics, holiday events, weddings, backyard camp outs, sleepovers, and barbecues! We’re devoted to the artisan marshmallow product. And because of this, we have had to be quite creative about the process of getting these made right. Downright innovative sometimes. But nobody cares about the process behind the scenes, because what makes our marshmallows so special is how they taste. Even after all these years of making marshmallows, we still love to eat Plush Puffs ourselves and share them with our friends and family because we think they just taste so darn good. We've tried all the other marshmallows out there - and there are some good ones. But we consistently come away feeling confident that ours are best gourmet marshmallow product. available. We think you'll agree. Learn more about Plush Puffs here . The Sterno S'mores Maker Jr. is the perfect way to bring the fun of s'mores with you, no matter where you are. Learn all about the S'mores Maker Jr., what you can expect to find in your kit, and how to use it safely. Use #tryazon and #smoresmakerjr to include your tweet on this page! The fun begins in May, when parties will be hosted! Tryazon will select up to 150 hosts for this party.